On 15 May 2015 a court in Simferopol, Crimea, found Oleksandr Kostenko guilty of committing an offence in Kyiv in February 2014 and sentenced him to four years and two months in prison. Kostenko was charged with two offences, allegedly committed on 18 February 2014 during the EuroMaidan protests in Kyiv, namely: under Article 115 § 2.b of the Russian Criminal Code (deliberately causing mild damage to health for motives of political, ideological, racial, ethnic or religious hatred or enmity, or for the same motives in relation to a social group); and under Article 222 § 1 (unlawfully obtaining, keeping or carrying the main parts of a firearm”). Halya Coynash, reporting for Human Rights in Ukraine, writes: "The investigators claimed that in January 2014 Kostenko joined the EuroMaidan protest in Kyiv 'in order to show armed resistance to law enforcement officers.' On February 18, so the investigators’ version goes, 'out of a feeling of ideological hatred and enmity to law enforcement officers' he deliberately aimed a cobble stone at V.V. Poliyenko, an officer of the Crimean Berkut special force unit. This supposedly resulted in Poliyenko receiving an injury 'in the form of a large haematoma on the left shoulder'." Kostenko had been in pre-trial detention since his arrest on 5 February 2015. 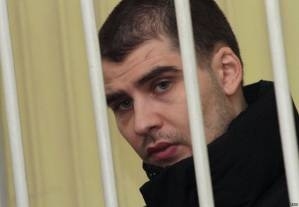 According to his lawyer, on the eve of the final court hearing on May 15 Kostenko was deprived of food for three days and beaten. Kostenko made other allegations of torture that his lawyer claims have not been adequately investigated. His lawyer intends to appeal the ruling, and has said he will take the case to the European Court of Human Rights if necessary.